Samsung makes some of the best mobile displays in the world. The AMOLED panels on Samsung smartphones is one of the reasons why many users buy their products. However, Samsung mobile displays are not without their share of problems and complaints. Overly saturated colors are one of the most common complaints associated with Samsung’s AMOLED displays. Samsung has been continuously improving its AMOLED panels to stay ahead of the competition. In fact, the Infinity Display on the recently released Galaxy S9 and S9+ is rated as the best mobile display in the market. Unfortunately, even the best mobile display in the market seems to have some issues according to the complaints online from some Galaxy S9 users. On various forums online, some Galaxy S9 owners are reporting color banding issues on their brand-new smartphones with dark/black images. Also termed as the black crush, the problem refers to a phenomenon where the screen has issues displaying shades of dark accurately, resulting in a grainy or a pixelated picture with blocks of black. The black crush effect should be apparent while watching dark images or videos as details are lost similar to a heavily compressed file. This is not exactly a new problem as many users have complained about this on the previous generation devices as well. So, either it’s a difficult problem to solve for Samsung or the issue is limited to only a small section of faulty devices. Currently, it is not clear how widespread this issue is. Samsung has not commented on the issue so far, though we’ve asked for a statement from the company and will update this story as soon as we get one. Have you faced a similar issue on your Galaxy S9 or S9+? Temporarily, you can fix it by “Screen Balance” app from Play store. Black crush like on LCD panels means the display suffered some type of damage during shipping. Maybe the box was crashed and some phone got damage. This can’t happen from normal usage. It happens when the phone is dropped or smashed. This is not a very common problem unless the device was dropped or smashed. I would just replace the device. make sure the device you get isn’t also damaged. I’ve never had a Samsung device where this wasn’t present. It’s a limitation of their Amoled displays, same as the purple smearing, and it’s not device-specific. Yes I have black crush on my S9 plus also. Yes I’m suffering this black screen crush on my s9+ I even exchanged it for a new s9+ but it’s the same thing again please help it gets really bad in the night even the official s9+ wallpaper has the black screen crush issue its more visible in the night? You are a liar. Unless you had your phone on for 24hrs a day, 7 days a week for at least 6 months, it would be impossible to have display burn-in. You are simply riding the hate bandwagon. Please go back under your rock you lying loser. Even display phones at stores don;t have burn-in and they are on all day. You expect us to believe you have such on a not even month old phone? Everyone isn’t as stupid as you. All s9+ user suffer from this black crush and specially when watching HDR shows . 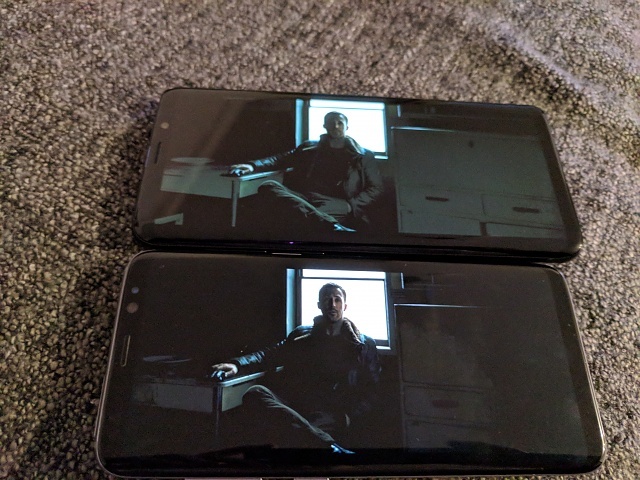 this issues it’s more agressive with s9+ display specially in low light , impossible to watch shows in the dark and you can check (the man in high castle) on amazone video prime only the first 2 to 3 min to see what i’m talking about . That’s untrue. All S9 plus owners do NOT have that problem. My wife’s S9 plus is absolutely stunning. Did you ask ALL S9 plus owners if they had a problem? What a stupid comment. Your problem is most likely with Amazon Prime which has a lot of quality issues with its streaming. 2. Generalizing from a select few users (no, 10, 20, or even 200 users on XDA is most definitely NOT “a lot of people” – given how well the S9 and S9+ sells, I’d say even 20.000 users is a margin-of-error amount) is not the way to go. My god. Just watched that episode and man!! It’s so bad. Does it come under a defect category? I have an s9 plus and I don’t have this issue! You don’t have stats or evidence to back up your claims! And no citing XDA forums is not actual evidence! You can check Anandtech S9/S9+ Review , you will see the difference between s8, s7, s9 , displays I’m Samsung user since Jet and omnia ligne up . But Samsung can fixe it with a simple update, Hope Sammobile team can ask Samsung for a fixe. I checked 4 s9+ displays all of them suffering from the same issue more noticeable when watching HDR only in dark room. I have the same problem on my Note8. Had it also on my S7Edge. It makes some of the GearVR content a pain to watch. Surprisingly my wife’s S6 line is totally free of this issue. I had “black crush” on my Note5 but not I’m my current phone, the S7 edge. It is normal on Amoled disaply. Smudging. J5 2016 one of the phones that don’t have it. I have it on S7 Edge, when viewing gray and black in low brigthness.